As part of her graduate student research, Vaishali Kandpal is evaluating a novel tail-water recovery system. Many farmers who use conventional furrow irrigation methods lose large quantities of water from excessive tail water that leaves the field. Farmers build tail water recovery systems to address this, but such systems are expensive and involved. To date, farmers have been reluctant to adopt the practice in Arkansas. However, graduate student Vaishali Kandpal is looking to change that. 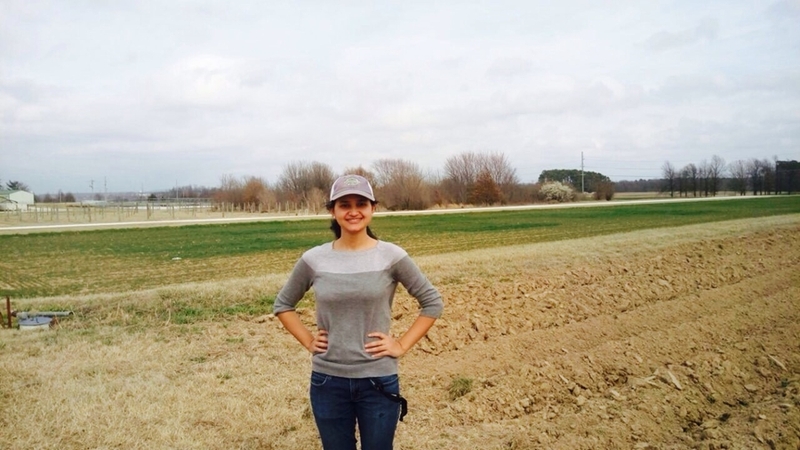 Kandpal is evaluating a variable-flow tail-water recovery pump, which her adviser Chris Henry developed, that would allow farmers to increase irrigation efficiency and help them conserve water and energy at a much higher rate. The efficiency results the pump and the system has produced so far are encouraging. "In conventional continuous flow irrigation systems, the irrigation efficiency is about 40-60 percent, but with our variable flow tail water recovery system we were able to achieve 92-97 percent efficiency in a trial in a rice field in summer 2016," said Kandpal, a biological engineering master's student. "That's huge." In conventional recovery systems, tail water is collected in ditches in a farmer's field. The collected water is then pumped from the ditch into a water reservoir and later used for irrigation. "To work well, the conventional tail-water recovery system involves construction of a reservoir and ditches that take a large amount of land out of production," said Kandpal. With the variable-flow pump, water is collected in a sump in the field and then circulated in the same field from which it was collected. The pump can be powered from the grid or by solar power. "With this method, the farmer doesn't have to worry about a reservoir or any major changes in their already established fields and are still able to improve irrigation efficiency," she said. The advantages of the variable flow pump go beyond water conservation. Because the tail water is collected and is not drained, it reduces the flow of pollutants into streams. Though Kandpal has found her new pump to be more efficient than furrow irrigation methods, she is still working to determine the economic viability of her novel system. "If my research proves the performance and economic feasibility of this system, then it may be possible for farmers to invest and use this type of system," she said. Kandpal, a native of Nainital, India, earned an undergraduate degree in agricultural engineering from Govind Ballabh Pant University of Agriculture and Technology. She is on track to complete her master's degree at the University of Arkansas in fall 2017.